When is a Sears House Not a Sears House? A house owned by Bowling Green State University baffled Sears house researchers in 2012. 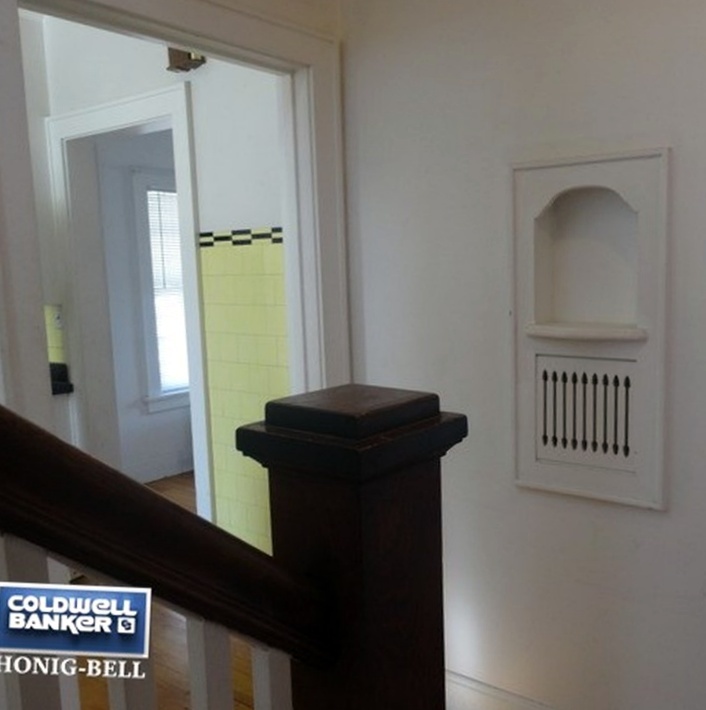 It was a Sears model called the Colchester, but evidence in the house indicated it was actually from Montgomery Ward. At the time, this house seemed an anomaly. But kit house research has come a long way since 2012 and several hundred houses have been discovered and authenticated since then. And we have learned that the Bowling Green case was not the only time a kit house company built another company's model. Let's take a closer look at some of these lookalike houses. 935 S Fairfield, Lombard. Thanks to Jean Cooper of the Lombard Historical Society for the background on this house. This house was identified in an architectural survey as a Sears Maplewood. Looks like a solid match, right? 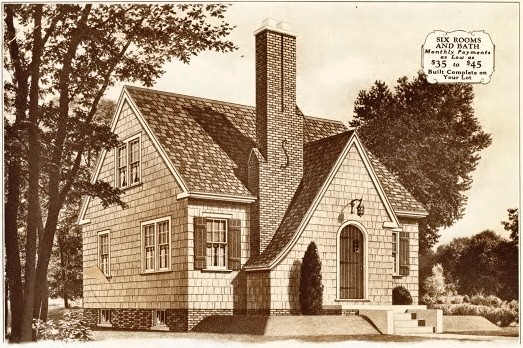 The house has two windows on the right side rather than one, but the proportions look right, and all the windows on the sides match the Sears illustration. And herein lies the problem. The individual who did the survey didn't do an intensive survey, which is the typical way architectural surveys are conducted. They simply did a "windshield survey", or a quick reconnaissance of the area done from a car. The purpose of a windshield survey is for the researcher to gather information about the general distribution of housing styles and periods. It serves to identify properties that are worthy of more detailed research. A windshield survey is supposed to be the first step in a full survey--not the complete survey. An interview with the homeowners would have led to this discovery: On a door casing was written: “A.C. Koller, 935 S Fairfield, Lombard ILL, Montgomery Wards Davenport Iowa”. This Sears Maplewood is no Sears house. Like with the Bowling Green house, Montgomery Ward designed a lookalike Sears house for its customer, A.C. Koller. The vast majority of Sears houses you will see on the Internet were identified using a windshield survey only. As you might imagine, this is where critical mistakes are made in the identification process--often a quick glance isn't good enough. How many purported Sears houses are not really Sears houses at all? 1425 Ridge Road, Munster, IN. Photo courtesy of Carrie Milam. The Montgomery Ward Yorkton from 1931. 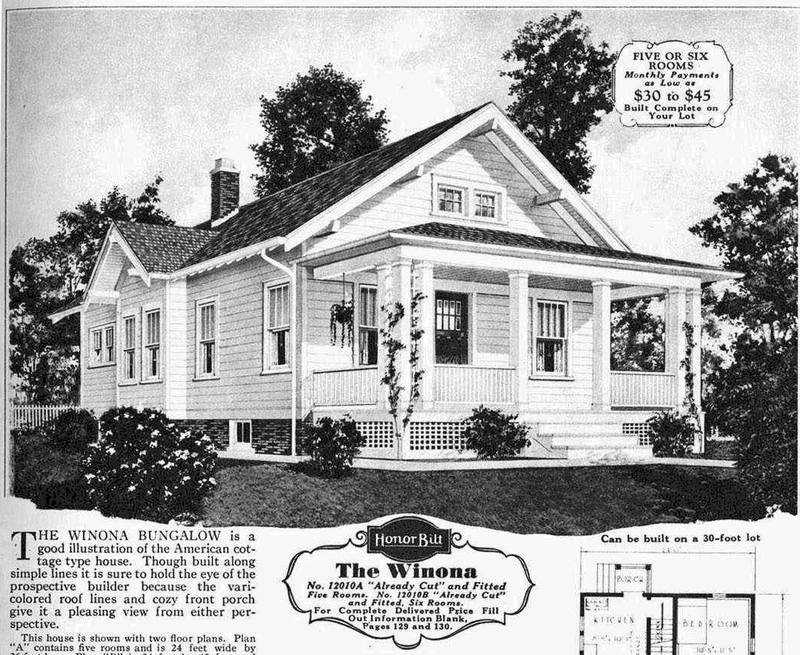 Image from Montgomery Ward's Mail-Order Homes. You won't find this house in any Sears Modern Homes catalog. A quick windshield survey would lead to the conclusion that this 1931 house is a Wardway Yorkton. Ad from the Hammond Lake County Times, September 1931. Thanks to researcher Judith Chabot for passing this along. Sears didn't officially sell a model that even resembled the Yorkton. The Yorkton was sold in 1931 by Wards, the same year this house was built. Were customers coming into the nearby Hammond, Indiana sales office and asking whether Sears could build a house just like the Wards Yorkton? Was Wards selling a large number of Yorktons in the area and the local Sears office wanted some of that business and created their own knockoff? They obviously thought they could sell many of them since they used the design for their model house. This house in Munster wasn't the only Wardway Yorkton that Sears built. 2128 Kemble, North Chicago. Image from Google Streetview. This Yorkton in North Chicago had a Sears mortgage. Art and Ida Giampaolo got a mortgage from Sears in July 1931 for this lookalike house. Art worked at a candy factory, and the couple stayed in the house until the 1950's. There was a Sears Modern Homes sales office in nearby Waukegan that the Giampaolos almost certainly visited. Were the sales offices encouraging customers to bring in any kit house plan and Sears could build it for the same price? 2511 Orange St. Lake Station, IN. Photo courtesy of Carrie Milam. 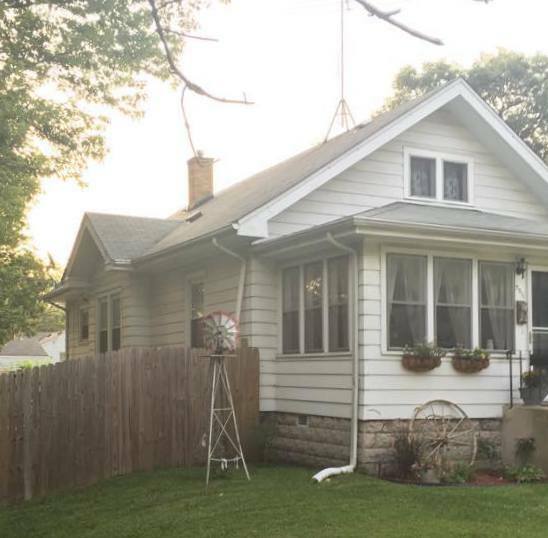 When Carrie Milam bought her house in 2014, everyone told her it was a Sears house. The house looked like a Sears Winona model, and it matched the Winona's floor plan and measurements down to the inch. Carrie went to the county offices to pull the original mortgage record for the house, and found that the Sears Winona was, in fact, sold by Montgomery Ward. The house cost $4600 and Wards sold it to Frank and Pearl St. Germain in August 1930. Frank was a steelworker. Unfortunately, the St. Germains could not make their mortgage payments during the Depression and the title to the house reverted back to Wards in January 1933. Carrie calls her Winona a "Franken-house"! 405 Opatrny, Fox River Grove. This Sears Mansfield had a mortgage from Montgomery Wards, issued in 1930. 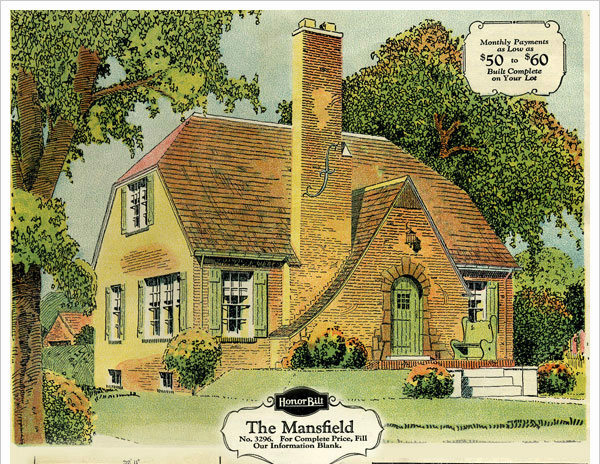 Again, Wards didn't sell any house in its catalogs that remotely resembled the Mansfield. The original owners were James and Magda Kos. James worked as a butcher and died in 1935. In 1939 Magda moved to Florida with her son. That is the standard phone nook from Wards. Is that original tile in the kitchen? Photo from Realtor site. I haven't seen any advertising that stated that the kit house companies would build another company's house. But these houses are authenticated with mortgages, and prove that the practice was going on and was likely promoted through certain sales offices. Excellent post, Lara. It's amazing what thorough research brings to light! I have one here in Springfield, Ohio, too, I think. Ward's mortgage but the house matches the Sears Jewel, not the Gordon-Van Tine York, which is what I assumed it was when I located it. I'll need to review my unknowns from the Cincinnati mortgage list as well. Cindy, I think the Sears Jewel (a.k.a. the Wilmore) was one of those Sears models that Wards sold. I have a few Wilmore lookalikes in Waukegan, Illinois.